FaceLogic Spa franchise business opportunity. Free FaceLogic Spa business franchise information. We at Facelogic will serve with passion, values and integrity to provide routine skin care that is essential for healthy skin. Our innovative concept offers affordable services and products. Facelogic spa is affordable luxury. Facelogic spas were designed by one of the top spa designers in the nation. From the moment a client walks through the doors of a facelogic spa, our talented, highly trained staff will make every effort to ensure their visit is pleasant and satisfying. During a visit to facelogic, skin care professionals provide one-on-one education, personal care and services that exceed every expectation. All this is done in a clean, inviting, non-intimidating environment. A Facelogic franchise is an affordable franchise opportunity in an exploding industry. Facelogic is a niche concept led by a seasoned and winning management team of experienced spa industry professionals, including the retired President of Curves International. 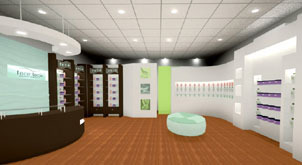 The Facelogic Spa concept provides skin care services and retail products at an affordable price, via a club membership program. Currently 15% of consumers are being serviced at the spa on a routine basis. The spa industry is focused on providing services to an elite population. Facelogic Spa plans to service the other 85% of consumers which are currently not able to enjoy the spa, which include baby boomers, teens, and men. Consumers are seeking value. If given the opportunity, everyone would love a day at the spa. Facelogic will reach the consumer who would love skincare services but, until now, thought they could never afford. Boomers have now created an industry centered on defying the aging process. U.S. consumers will spend more than $30 billon on anti-aging products. Facelogic Spas were designed by one of the best spa designers in the nation. Franchise Times has ranked health/fitness/beauty one of the "hottest" segments for franchise development. How may we serve you? Currently Facelogic Spa franchise opportunities are available in U.S. and Canada. To learn more about the FaceLogic Spa franchise opportunity, simply complete the form below.